Auto portability is the routine, standardized and automated movement of an inactive participant’s retirement account from a former employer’s retirement plan to their active account in a new employer’s plan. Auto portability is a voluntary benefit, i.e. participation is not mandated. Like participation and investment selection, portability is a plan feature whose use is sub-optimized due to participant inertia and/or frictions with the plan-to-plan transfer process. These frictions produce negative consequences for participants’ retirement security. Auto portability is the first industry-wide solution to address this problem. Auto portability can be readily implemented by introducing critical infrastructure that links employer-sponsored plans, maintains and promotes technology standards and interfaces, and directs the flow of data between record-keepers – a clearinghouse / common infrastrucutre that serves the portability and consolidation needs of America’s mobile workforce. Auto portability utilizes technology to reduce the time, paperwork and expense associated with moving a participant’s account into their new-employer plan after they change jobs. Auto portability was conceived to serve the needs of participants that are subject to the Mandatory Distribution / Force Out provision of their employer-sponsored plan, i.e. accounts with less than the current limit of $5,000, and is designed to work within the existing infrastructure and data flows of the qualified employer plan system. Presupposing a future change from the current $5,000 limit to perhaps $15,000, auto portability can be readily adapted to larger account balances. Auto portability fits neatly into the framework of the many “auto” innovations – such as Auto Enrollment and Auto Investment Allocation (target date funds) – that have proven successful in enhancing the retirement-saving prospects of millions of Americans. Today’s steady increase in the adoption of Auto Enrollment has triggered the creation of increasing numbers of small accounts in plans and further highlights the need for auto portability. Why is auto portability needed? Auto portability is needed because it directly addresses the problems created by small-balance accounts, automatically moving retirement savings forward when participants change jobs. The Employee Benefit Research Institute (EBRI) estimates that the average American will have 9.9 jobs over their working career, producing an estimated 14.8 million job-changing plan participants every year. The impact of the decisions that these job-changers make can create adverse consequences for their retirement savings. Participants with less than $5,000 that don’t respond to a notice are forced out of their retirement plan and into a Safe Harbor IRA, where by statute they are invested in money market funds that yield little or no interest. Low money market returns combine with annual administrative fees to deplete these accounts over time. Participants with account balances between $5,000 and $15,000 are permitted to keep their inactive accounts in their former employer’s plan, yet industry reports indicate that these accounts remain at high risk of premature cash out. In addition, terminated accounts are often incur additional record-keeping fees. Of the 14.8 million annual job-changers, 6 million, or 41%, will cash out their retirement savings completely. Two-thirds of these cashouts are for reasons other than a financial emergency. Participants with account balances of less than $5,000 are prematurely cashing out their savings at rates approaching 60% at the time of their job-change (“fast leakage”). That’s not the whole story because accounts that are rolled over to Safe Harbor IRAs remain at risk. Of those whose savings are retained in a Safe Harbor IRA, research shows that an additional 24% of the remaining original accounts cash out by the seventh anniversary of their job-change (“slow leakage”). Participants with account balances between $5,000 and $15,000 are also prematurely cashing out their savings at rates approaching 40% at the time of their job-change. Combined leakage for all accounts less than $15,000 is estimated to be 47%. Over time, participants change residences but neglect to update their address of record or lose track of their old accounts, creating the potential that these savings will ultimately be depleted by fees or lost to them via escheatment to their state of residence. 2018 research conducted by Boston Research Technologies finds that 11% of all terminated account records have a stale address, and that 1 in every 5 job changer relocations results in a missing participant. What is the value of savings preserved by auto portability? Perhaps most impressively, EBRI's Retirement Security Projection Model (RSPM) estimates that auto portability will reduce the nation's $4.13 trillion Retirement Savings Shortfall (RSS) by $2 trillion, when applied to all balances, and by $1.5 trillion, when applied to balances less than $5,000. Also, the EBRI RSPM model indicates that auto portability, when combined with expanded access initiatives, such as universal defined contribution, or open MEPs, delivers significant, incremental reductions in the RSS than the expanded access initiatives by themselves. The Auto Portability Simulation (APS) is a dynamic, discrete event simulation, developed by Retirement Clearinghouse in collaboration with Dr. Ricki Ingalls, PhD, of Texas State University and with key input data assumptions supplied by EBRI. The APS models the behavior of individual job-changing participants over 40 years, and simulates multiple scenarios, with and without auto portability. The APS consistently demonstrates that auto portability will dramatically reduce cashouts and act to preserve retirement wealth in all scenarios in which it is applied. For example, in the sub-$5,000 balance segment that is currently subject to mandatory distributions, auto portability reduces cashouts by over 50%. That's 91 million job-changers who will preserve their retirement savings, over a generation, equating to $784 billion in savings preserved, when measured in today's dollars. For more information on foundational research supporting auto portability, visit the Auto Portability - Foundational Research section of the RCH1.com website. How many workers will benefit from auto portability? Each year, 14.8 million defined contribution plan participants change jobs. Of these, 6 million will cash out $70 billion of retirement savings completely. Over 40 years, that figure increases to 261 million participants cashing out $2 trillion, in today's dollars. The highest rate of cashouts occurs for participants with balances less than $5,000. Of the 5.3 million plan participants changing jobs with a balance less than $5,000, 4 million, or 75% of all job-changers, will cash out. That's 174 million participants over a 40-year period, cashing out $1.5 trillion, in today's dollars. With auto portability, these cashouts are reduced by over 50%. Under auto portability, 91 million of these participants will preserve their savings, over a 40-year period. Which workers will benefit the most from auto portability? 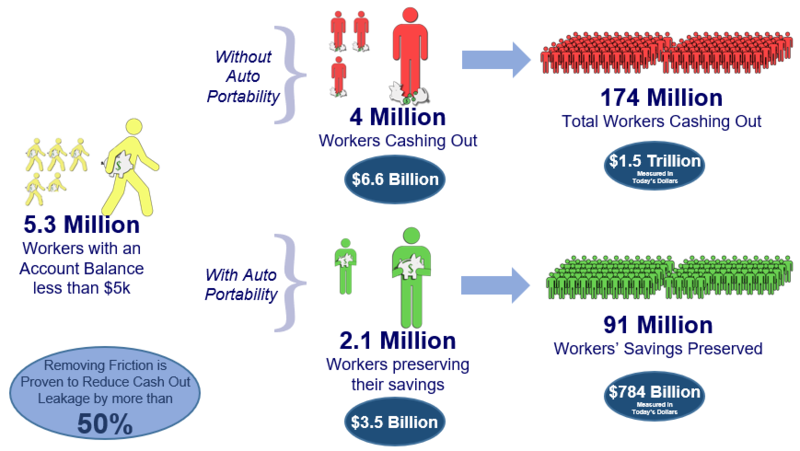 Auto portability's benefits will largely accrue to middle class Americans, but will also disproportionately benefit those segments of the population who have smaller balances and are more prone to cashing out their balances during a job transition. The figure below shows the disparate impact of cash out leakage, by demographic category, and indicates that younger, lower-income and minority participants -- particularly African-Americans -- could stand to derive significant benefit from preservation of their retirement savings. When viewed from a gender perspective, women would also benefit disproportionately from auto portability. As the figure below indicates, with small balances women have increased odds of cashing out, but at higher balances, women are more-likely to preserve their savings. By incubating and preserving women's small balances, auto portability can more-quickly bring women's retirement savings balances to higher levels, where they're more-likely to generate retirement wealth. How badly does a small balance cash out damage a worker’s retirement? Cashing out -- even small balances -- can have a highly-detrimental effect on retirement security. Conversely, preserving these small retirement balances can dramatically enhance an individual's wealth at retirement. As the figure below shows, the value of preserving those small balances is significant, growing from $70,000 in scenario #1, to $105,500 in scenario #2, and to $123,600 in scenario #3. By contrast, each $5,000 cashout would have yielded only $3,500, when taxes and early withdrawal penalties are applied. What problems does auto portability remedy? According to a 2009 U.S. Government Accountability Office report, 89% of all leakage occurs at the time a participant changes jobs. Auto portability creates a new option that inhibits leakage by systematically consolidating savings in a new employer’s plan, thereby incubating savings when accounts are small and most at risk of being cashing out, and methodically increasing overall retirement savings. Leakage is particularly acute among younger, minority, and lower-income participants. Auto portability has the potential to help 20,000 small-balance participants per day retain their retirement savings, which will accumulate to more than $1.3 trillion over the next generation of savers. Auto portability utilizes technology to systematically consolidate savings in a new employer’s plan, reducing unnecessary costs incurred from maintaining multiple accounts. Consolidating participants’ retirement savings in their current-employer plans leads to fewer accounts classified as “lost/missing” simply because fewer accounts are stranded across the qualified plan universe. Savings rolled into a participant’s active plan will be invested according to the participant’s standing investment elections or in the plan’s default investment option, an appropriate investment alternative that has the potential to produce compounded earnings of 5% to 7% per year over a long investment horizon, a significant multiple versus the 0.10% to 0.5% annual interest earned in the money markets funds utilized in Safe Harbor IRAs. Each of the above issues traces their roots to a common cause: systemic frictions that frustrate saver’s best intentions to retain and grow their retirement nest egg. These frictions are most evident at the time of a job change and can be remedied by adopting standards and using technology that links plans. The benefits of auto portability accrue to all employers in the form of lower plan administration expense and burdens for plan sponsors, a benefit achieved through both a reduction in the number of small, inactive accounts and the increase in active account balances as auto portability transfers new employees’ savings into their current employer plan. Expense reductions are also realized as the incidence of lost and missing accounts is reduced, as well as the incidence of uncashed checks. Administrative cost and burdens are a particularly acute issue for companies that exhibit high rates of employee turnover, such as those in the retail, hospital services, transportation, hospitality, and food & beverage industries, which collectively employ tens of millions of workers. A secondary benefit to employers is the increase in financial wellness experienced by their employees as they preserve their savings and accumulate larger account balances over time. What are the benefits to service providers? The benefits to financial institutions and service providers include increases in the assets that they invest and service as well as a significant reduction in the number of small accounts over time. EBRI has estimated the present value of retirement assets retained from plugging cash out leakage through auto portability to be $1.5T for accounts below $5,000. Like employers, service providers also benefit from a reduction in small accounts. Auto portability has been introduced to a majority of the larger plan service providers and has seen measured progress along the path to adoption and implementation. Twelve of the top thirteen record-keepers have engaged Retirement Clearinghouse in auto portability discussions. Can auto portability’s benefits be extended to larger accounts? Yes. In general, the benefits of ‘frictionless portability’ can be applied to accounts of all sizes. EBRI, the retirement industry’s premier research institute has recently published its ‘Auto Portability Scenario’ that quantifies these broader benefits, indicating that perfect auto portability for accounts of all sizes would retain an additional $2T in retirement assets, as measured in today’s dollars. However, the guidance received from the Department of Labor is specific to accounts subject to a Mandatory Distribution (currently, those below $5,000). What makes auto portability work? The “heart and soul” of RCH Auto Portability, the auto portability solution introduced by Retirement Clearinghouse, is an electronic records matching technology that is used to Locate & Match℠ participant accounts across record-keeping platforms. The Locate & Match technology is flexible and secure, and can be employed across a wide range of account types and platforms to locate and match participant accounts. For example, the technology can be utilized to confirm that an account in a Safe Harbor IRA belongs to the same participant with an active account in their current employer’s plan. Similarly, the technology can be utilized to confirm that an inactive account in an employer’s plan belongs to the same participant with an active account in a different employer’s plan. In addition to the Locate & Match service, RCH Auto Portability encompasses record-keeping and customary account services. Record-keepers can continue to maintain small accounts on their platforms (defined contribution plan or Safe Harbor IRA) while utilizing the Locate & Match service to help participants keep their retirement savings intact. Alternatively, record-keepers may choose to outsource account administrative services to a third-party service that provides the Locate & Match service on their behalf. RCH Auto Portability also includes an automated account roll-in service that facilitates a roll-in to a new employer’s plan, which occurs after a successful Locate & Match. An automated roll-in reduces the friction, time and expense typically spent moving a participant’s savings into their new employer’s plan. How does RCH Auto Portability work? 1) Notices: Upon becoming subject to a Mandatory Distribution, legally-required information notices are provided to participants in the auto portability program. Account information is extracted, formatted and passed to the clearinghouse (RCH). The clearinghouse collects, standardizes and re-distributes account information to all record-keepers that participate in the auto portability program. Participating record-keepers utilize the Locate technology to query their plan/participant records to identify potential matches of accounts. Upon attaining a successful Match, account information is further validated and a notice is sent requesting that the participant consent to the transaction. Affirmative written consent obtained at the time of enrollment in their new-employer plan. Affirmative consent given by accessing a secure website or voice response system. Affirmative consent given by contacting a call center. If no affirmative consent is provided, RCH will rely on negative consent to complete the roll in transaction if no participant response to properly delivered auto portability notifications (see Department of Labor guidance). The inactive account is closed and the balance is rolled into the participant’s new-employer plan. The balance is automatically invested according to the participant’s current investment elections, or if the participant has not made an election, into the retirement plan’s default investment option. The participant is notified when the account is moved and consolidated into the new-employer plan. Does RCH Auto Portability require that all safe harbor IRAs be record-kept and administered by RCH? No. RCH Auto Portability incorporates a flexible architecture that enables electronic record matching between any type of account repository / system that is used to record-keep plans or IRAs. What this means in practice is that once the technology interfaces are constructed, account records can be matched between any safe harbor IRA account held by any financial institution and any active plan record-kept by any financial institution. However, the Department of Labor Guidance received is specific to safe harbor IRA accounts with RCH or participating recordkeepers with a proprietary safe harbor IRA program, and plan accounts with participating recordkeepers. What does RCH Auto Portability cost & who pays for It? RCH Auto Portability is a “user-pay,” fee-for-service program. Participants pay for services only as they are used. RCH Auto Portability employs a progressive pricing structure; account balances below $50 will be moved to their new-employer plan at no charge, while accounts with between $50 and $590 will be charged proportionately lower fees as the account balance declines. Record-keepers that participate in the RCH Auto Portability program receive a portion of the per transaction fees to compensate for their cost of processing roll-in transactions. Due to the high ratio of accounts with less than $590 to the total of all Mandatory Distributions, the average fee for a participant rolling savings into their new-employer plan is estimated to be $40 to $45 during the period when transaction volume is less than 1 million per year. RCH Auto Portability also incorporates a 20% reduction in the fee charged to a participant when the annual volume of roll-in transactions exceeds 1 million transactions per year, i.e. the benefits of scale/critical mass are passed on to participants in the form of reduced fees. At these volumes, average fees are further reduced to $30 to $35 per transaction. A $6 communication fee may also be assessed to compensate for required program notifications.